Instructions: Cut a piece of white cardstock 10" x 7", score at 5" along the long side and fold to create a 5" x 7" base card. 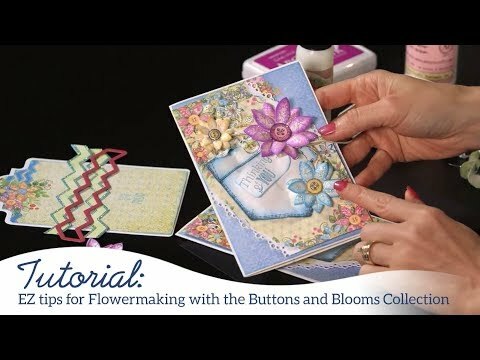 Cut a piece of blue patterned paper 5" x 7" and adhere to the front of the card. Cut the frame from the HCD2-7191 Intricate Swirls Frame Die in white cardstock and adhere to the front of the card with foam tape. Cut a 6" x 4" panel from the paper collection and adhere to the front of the frame. Add pearls to the edge of the paper. Paint the mannequin with white gesso and then two coats of Pearl White paint. Add Frosting powder to the mannequin with Dries Clear glue on a damp sponge. Adhere the mannequin to the front of the card and finish with a pink bow. Stamp the rose vine images from the HCPC-3834 Leafy Accents Stamp set in Library Green ink on white cardstock and colour in with Leaf Green and Fern Green inks before die cutting with the coordinating die. Shape using the coordinating mold. 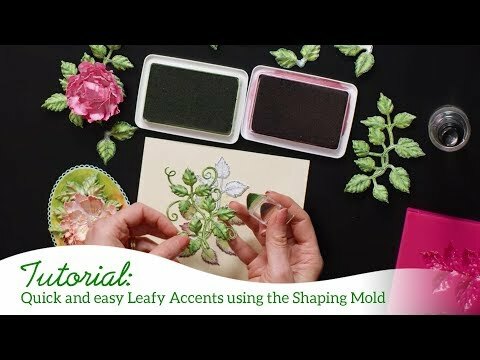 Add Crystal Clear glitter to the leaves using Dries Clear glue with a damp sponge. Adhere the leaves around the base of the mannequin and the top right of the card. Stamp the flower images in VersaMark ink on vellum and emboss with white embossing powder. Colour the images in a combination of Vibrant Fuchsia, Forget-Me-Knot and Buttercup inks before die cutting with the coordinating dies. Shape lightly and add Crystal Clear glitter with Dries Clear glue and a damp sponge. Adhere over the leaves as shown. Stamp the banner image and the Happy Birthday image from the HCPC-3851 Handstitched Accents Stamp set in Forget-Me-Knot ink on the zig zag patterned paper and die cut with the coordinating die. Nestle the dove tailed edge under the flowers on the top right of the card.